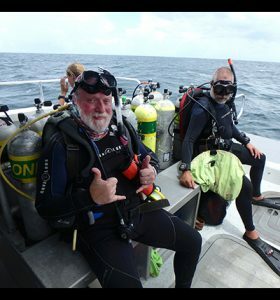 University of Connecticut Department of Marine Sciences research professor emeritus Peter Auster and colleagues, including a Marine Sciences student serving as an intern, just returned from a cruise at Gray’s Reef National Marine Sanctuary off the coast of Georgia. With funding from the National Marine Sanctuary Foundation, they were continuing a decade long study examining the behavioral interactions between predatory fish and their prey. 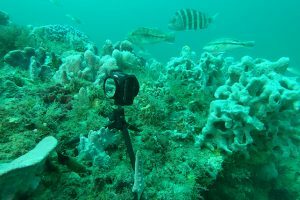 This year, they expanded the scope of their research by using new 360-degree virtual reality video cameras that allow researchers to record interactions over time periods beyond that of divers and without human interference and over. 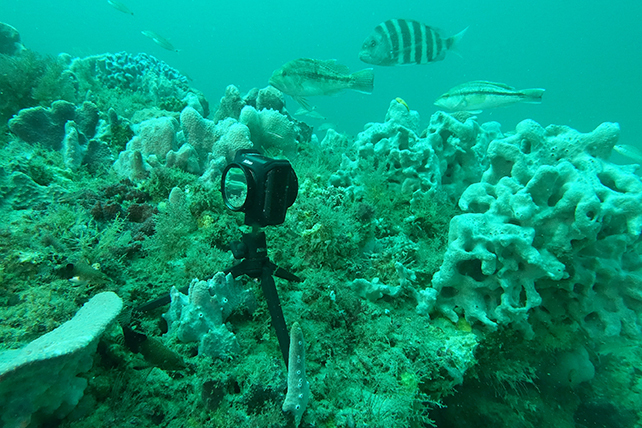 The field of view of the video covers nearly a 360 degree sphere around each camera so pelagic predators high in the water column as well as reef predators are captured as the interact to herd and attack schools of prey fishes. Understanding the functional role of such interactions can aid both conservation and sustainable fisheries goals in these sub-tropical reef ecosystems.